The Sator Square is the earliest dateable 2D palindrome. It was found in the ruins of Pompeii, at Herculaneum, a city buried in the ash of Mount Vesuvius. 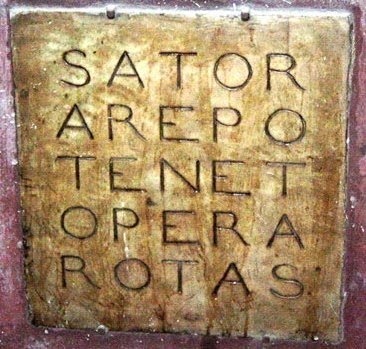 It consists of a sentence written in Latin: "Sator Arepo Tenet Opera Rotas." Its translation has been the subject of speculation with no clear consensus. (noun) work, care; aid, service, effort/trouble; (from opus): works, deeds. So, putting it together might look like, “The farmer/gardener (SATOR), AREPO has (TENET) and works (OPERA) the wheel or plow (ROTAS).” It seems like gibberish when spelled out that way. Until it was found in the ruins of Pompeii, it had been discovered in several areas where the old Roman empire had been located (England, Italy, Spain, and Egypt). While Christian mystics have laid claim to its alleged references to Christ, it actually has a more logical and stronger connection to Mithra (whom many scholars believe is the origin of the Christian myth). At least one numerologist I know has stated that Chaldean numerology* reveals a frequency or vibration, with possible musical connotations in this square. What I've found interesting about this magic square, is the results from those who have used it. It seems to be a very powerful ward of protection, for the one who carries it, and for the home. Simply write the square on parchment with Dragon's Blood ink, or you can write on red paper with gold ink. Let the ink dry. Place it in the home, your car, or on your person for protection. *Pythagoras actually studied Chaldean numerology.